When it comes to Real Estate (or any investment really) – Why do you want to buy right? Because it gives us confidence that we are making a good decision, thus offsetting the scaredy cat habit of indecision that wants to stop us. You also want to buy right because it will prevent you from buying a money pit! The first thing I do when I see a property for sale is run the numbers. 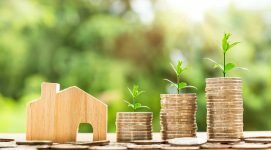 If the property is not going to cash flow when I take all the anticipated expenses and subtract them from the going rental rate then I move on. No point in viewing the property. I have an Excel calculator that I use to plug all these numbers in for my result. The beauty of using a calculator is you don’t need to work out the math yourself. However, in the end you should at least understand what is being calculated. Operating Expenses equal your total cost per year to hold that property. There is a quick general rule of them that Operating Expenses will cost 50% of your total rental income. It’s good for a quick calculation. However, I have found it more in the 40-45% range for all the properties I’ve run numbers on. 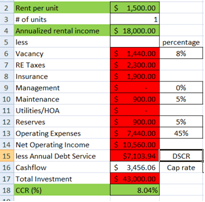 Total Rent – Operating Expenses = Net Operating Income. Now we can see how much cash flow the rental property is creating each year. Cash on cash return is the main number I use to decide whether a property is worth pursuing. This will tell me what return I am getting on my money. I generally look for atleast 8%, because otherwise I mind as well gamble my money in the stock market! I want a return that rivals the historic average of the S&P 500, but with real estate I have a HARD ASSET as well! Not to mention someone else is paying down my mortgage, but we will get into that in a later post. That’s the key number. I want to see 8% or better, that is my preference. I know investors that won’t accept less than 10%. Generating just enough for me to pursue this property. I literally walk you step-by-step through finding, buying and renting out a rental property. The book is your personal mentor!